On October 3, I attended “Lost in Space: 2016” at Rice University’s Baker Institute for Public Policy. The program brought together seven space policy experts (see photo) who reviewed the status of NASA and offered their advice to the next Administration regarding the Agency’s future. Rice University’s Baker Institute hosted “Lost in Space: 2016” with space policy experts, L to R: George Abbey (moderator), Mark Albrecht, Leroy Chiao, Joan Johnson-Freese, Neal Lane, Michael Lembeck, Eugene Levy, John Logsdon. Photo by Marianne Dyson, 10-3-16. The panelists agreed that the space program is inexorably tied in with our nation’s perception of itself and its reputation as a world leader. Several panelists stressed the benefits of exercising soft power (the ability to get what you want through attraction rather than through coercion) to reduce tensions and increase the security of the United States, specifically by cooperating in space with China. Former astronaut Leroy Chiao noted that cooperating with Russia has not caused the security or technical transfer issues that people feared which should qualm fears of similar cooperation with China. Joan Johnson-Freese, a professor at the U.S. Naval War College added that cooperating with China on the civilian side makes strategic sense through reducing tensions on the military side. This discussion naturally begs the question of what space project might be selected by the next Administration that would exercise soft power and appeal to the international community? My answer is: A Night’s Watch Telescope on the Moon! Why a telescope? We’ve been lucky so far, but it only takes one asteroid to wipe out civilization. Even a small strike on a major city could cost tens of billions of dollars. Obviously, preventing a global catastrophe is far cheaper than dealing with the aftermath (assuming we survive!). But establishing a “Night’s Watch” (ala “Game of Thrones”) on the Far Side of the Moon may not only prevent catastrophe, but reap immediate soft power benefits as well as scientific discoveries and the first steps to human space settlement. What I call the Night’s Watch Station and Telescope Array offers a clearly defined mission and use for the Space Launch System and Orion while providing opportunity to other nations to supply landers, modules, telescope arrays and computing facilities, rovers, crew, and scientific experiments. The lunar outpost and array could be assembled using a combination of human and robotic missions. Remote placement or operation of surface equipment might be conducted from Orion (or Soyuz? or Shenzou?) capsules in lunar orbit, good practice, technically and politically, for establishing a first base on Mars. 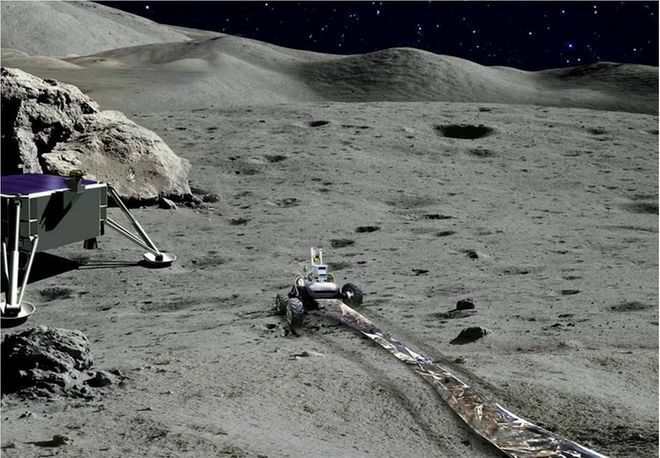 Artist’s concept of radio telescope array being emplaced by human-controlled rover on the far side of the Moon. “How Robots Could Build a Radio Telescope on the Moon,” by Leonard David. Image by Joseph Lazio/JPL. While building the telescope, scientists will have the opportunity to obtain samples and study the Moon’s far side mysteries up close. With the incentive of reducing logistical costs, engineers will develop ways to extract oxygen, water, and minerals from lunar soil. This capability will allow asteroid threats to be turned into resources—and help us prepare to live on Mars. Incrementally, a human-tended presence may become a permanent research base and testbed. This project also offers a smooth transition and opportunity for growth to the nascent private space industry that has little time to establish its customer base between now and when the ISS is retired. If we lose the capability to launch crew and cargo into space again, who will save us when the asteroid looms? Spinoffs in new technologies, astronomical discoveries that could rewrite our understanding of the universe, and savings in security costs by exercising soft power leadership, could payback much of the government’s investment in a Night’s Watch project. And saving the planet from an asteroid strike is, of course, priceless. So, what’s next for NASA? Could it be the “sword in the darkness… that guards the realms of men”? If you like this idea, please share a link to my website blog page or invite me to come talk to your club, school, or library. To the stars! October 18-December 13, 4:30-5:30 PM, teaching an after-school 8-week course called “Write Now!” for ages 10 and up (parents and adults welcome). Through a series of exercises and critiques, students will learn how to craft a story and pursue publication. Course meets at St. Thomas the Apostle episcopal school in Nassau Bay. To register, contact the school and ask for the Enrichment Coordinator. Cost is $200. Second Mondays. Houston Science Fiction/Fantasy Writers Meetup. Fourth Tuesdays, 6:30 PM, The Black Labrador on Montrose (at Richmond), Houston Writers House. Fourth Thursdays, 7 PM, Clear Lake Park, Bay Area Writers League (BAWL) monthly meeting. Wednesday, October 19, presenting “Get READ-y for space? !” at Harvard Elementary School’s Literacy Night. Students will learn what it feels like to go into space and check out a scale model of the International Space Station. Monday, November 14, 2016, 4-5:30 PM Central Time (and archived for viewing later). 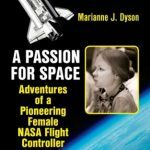 Guest on The Space Show with Dr. David Livingston to discuss the 35th anniversary of STS-2’s landing, experiences as one of the first female flight controllers, and current efforts to encourage young people to consider STEM careers.